If you've heard of Battletoads, you probably know it because of its notorious difficulty. Indeed, Battletoads is incredibly difficult, but this game deserves some more recognition for its other aspects as well, which are also quite impressive. So let's dig into this, piece by piece. I'll start with the difficulty since that's what it's known for, but instead of just saying "omg, I never finished level 3", let me tell you why the difficulty level in Battletoads is actually well designed. For one, the controls are pretty tight and responsive, even though it has a wide variety of gameplay, rarely are your deaths due to faulty controls. Unlike many classic beat 'em up games, in Battletoads, I almost never have trouble hitting enemies due to not being perfectly lined up with them or getting damaged from unclear contact boxes. If you get hit, it's usually your own fault. Just as importantly, the game gradually introduces you to new elements and doesn't just throw death at you unexpectedly. This game isn't like I Wanna Be the Guy which requires you to memorize every trap by trial and error; the difficulty in Battletoads is fair. It is such that for the most part you will know how the game works, know what you have to do, and theoretically, if you were good enough, you would be able to survive on your first try just by your skill. But don't feel too bad; no one in the world is good enough to beat this on their first try. Sure, there are a few points that may induce unexpected deaths, but for the most part, each obstacle is introduced slowly, so you know what you have to do when it gets harder later in the level. The infamous Level 3 is a perfect example. It doesn't just start throwing obstacles at you that you have to memorize; it starts off slow and quickly speeds up once you understand the basics. It even indicates where incoming obstacles will be, so all you have to blame for your death is your own lack of skill. There are even fairly regular checkpoints in each level. The only points I'll concede are that the inability to save and limited continues are a bit unfair. There are also a few glitches, which certainly aren't representative of the game as a whole, and the fact that you can attack your partner while playing 2-player also detracts a bit from the experience. But for the time, that sort of thing was pretty standard. If the game had been released today, the glitches at least could have been patched and saving would be simple. Looking back, the graphics in Battletoads may not be all that exciting, but they're actually some of the best on the NES. Not only are all the characters, enemies, objects, and backgrounds really detailed, but the art direction is unique and there's even some parallax scrolling going on (as seen in the Turbo Tunnel video above). 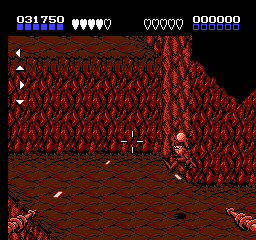 As for the unique art direction, that comes in mostly with the toads' attacks, which often involve their arms and legs becoming comically huge as they smash the enemies or even them growing ram horns as they headbutt enemies. 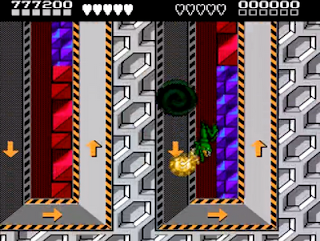 In some levels you can even pound enemies into the ground and then kick them and in another you can momentarily transform into a wrecking ball. It doesn't make any sense, but it makes destroying your enemies all the more satisfying. Turning into a wrecking ball isn't normal. But on Battletoads it is. It spins! As you run side to side, the tower moves to give the impression that you're running around it! How cool is that!? The enemies and platforms move with it too for a believable effect that was way cool for the time. 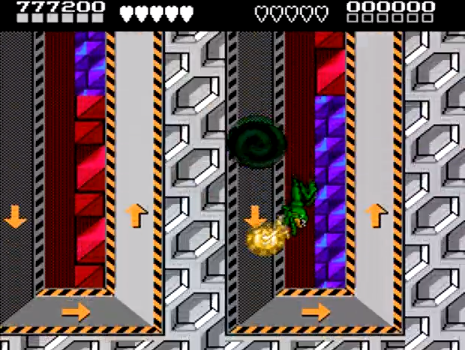 The only other place I had seen something like this was in Kirby's Adventure, which also had some of the best graphics on NES, but the effect in Battletoads goes above and beyond even Kirby in this case. That Kirby example wasn't even in the GBA remake of Kirby's Adventure, because they were either unable or unwilling to do the same awesome effect again on a new system. So that just shows how special and impressive it is. The music... is also pretty good. It's original, it's catchy, and there's a fair bit of it too. And in a game this hard, it's extra important to have good music, because you'll be hearing it until you finish the level. At least while you're dying you can be bobbing your head to some good and memorable music. I guess I can't claim that it's all fantastic music, but I'd say about half of it is really good. Oh, and by the way, it's composed by David Wise, the same composer who made the music for the Donkey Kong Country games. Just as almost every level has original music and art, they also have a wide variety of gameplay. This game is only partially a beat em' up game; the rest is swinging on rope, riding hoverbikes, throwing snowballs, racing rats, riding snakes, flying a jet, surfing, and defying gravity on a one-wheeled vehicle while being chased by a ball of energy. Any other NES game would've taken just one of these ideas and made a whole game out of it, but Battletoads explores each, makes them challenging, and then swiftly moves on to something new before anything becomes too stale. Many of the levels introduce small new things too that are used only in that level, like springboards or ice blocks that slide. These new elements are consistently well executed and are the biggest factor that makes Battletoads so great. When you finish a level, you deserve something for your trouble, and what you get is practically a new game in itself. Then there's really neat and clever things throughout, like the boss of the first level which is fought in 2nd person, that is, from the boss's perspective. I can't say for certain that this doesn't exist in any other game, but I certainly don't remember it from any other games I've played. There's also an enemy that looks like a classic Space Invader that actually steals your health directly from your health bar. In order to regain the stolen health, you have to hit them before they get away and then catch the squares of health they drop to make them go back up to the health bar where they belong. It's really unique and interesting stuff and it makes the game even more fun to play. Battletoads may only have 12 levels (13 if you count the final boss), but they are absolutely packed with content. With tons of unique graphics, enemies, gameplay, music, and challenges that are rarely unfair, Battletoads deserves to have a reputation as a great game rather than just a hard game. Here's hoping for another sequel someday. TheMexicanRunner, one of the best Battletoads players in the world who speedruns the game on Twitch. Thanks for linking to this post!